Why stay in the same boring hotel rooms when you can have a unique relaxing experience at the Alpine Haus Bed and Breakfast Inn in Vernon, New Jersey? Having spent our prior careers in the corporate world and understand the need for quality, clean and safe lodging during official area visits. Our warm accommodations and many choice amenities will make you feel right at home, plus you will have a real homemade breakfast every day! Many of our corporate guests enjoy the experience so much that occasionally their spouses accompany them on return business trips. 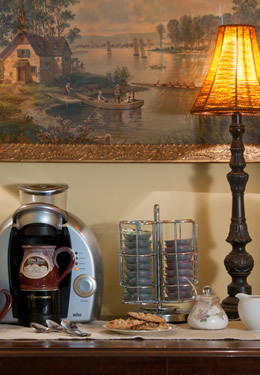 The inn provides meeting facilities available for small corporate retreats and business gatherings. Call for details. 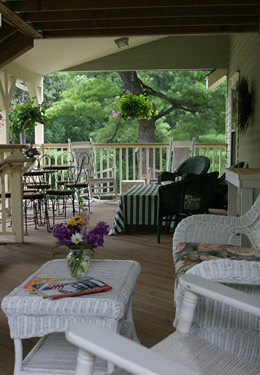 Enjoy working on the porch with wireless Internet service. *Corporate rates are available for one person per room Sunday through Thursday, excluding major Holidays. Extended stay rates available upon request.